The 10% reservation announced for economically weaker sections (EWS) by the Bharatiya Janata Party (BJP) government “may be usurped by the wealthiest”, while the minimum income guarantee announced by the Congress party could be “a game changer” provided it does not come at the cost of social spending, which is currently too low in India, a new report by The World Inequality Lab, a research organisation, says. Economic inequality in India is at record high levels and the next government will have to seriously address this issue, “rather than just focusing on growth as it has been the case until now”, Lucas Chancel, co-director of The World Inequality Lab, said in a statement. Since the 1980s, the top 0.1% of earners have captured a higher share of total growth than the entire bottom 50% of the Indian population (12% vs. 11%), while the top 1% have received a higher share of total growth than the middle 40% (29% vs. 23%) of the population, the report notes. It compares the promises that the BJP and the Congress have made ahead of the 2019 general elections to help the poor. Under the Congress party’s Nyuntam Aay Yojana (NYAY or minimum income scheme) announced on March 25, 2019, the poorest 20% of Indian families (which are estimated to number 50 million families or 250 million people) would given a cash transfer of up to Rs 6,000 a month to ensure they have a monthly income of Rs 12,000 (or Rs 72,000 a year). The BJP government announced a 10% reservation for EWS in the general category in January 2019. Parliament approved the Constitution (124th Amendment) Bill to provide 10% reservation in government jobs and higher education institutions for economically weaker sections, as IndiaSpend reported on January 14, 2019. “The minimum income proposed by the Congress could be a “game changer” but not if it entails curtailing social spending, Chancel said. Using simple projections, a minimum income set at Rs 72,000 per year would cost about 1.3% of GDP and benefit the bottom 33% of households, the report says. If it were set at Rs 1 lakh a year, the scheme would benefit the bottom 48% of households and cost 2.6% of GDP. “In either case, a minimum income would represent a substantial improvement in living standards for the poorest segments of society,” the report says. Highlighting the need for “more transparency” on income and wealth data, the report emphasises that minimum income must be in addition to improvement in social spending on education and health. 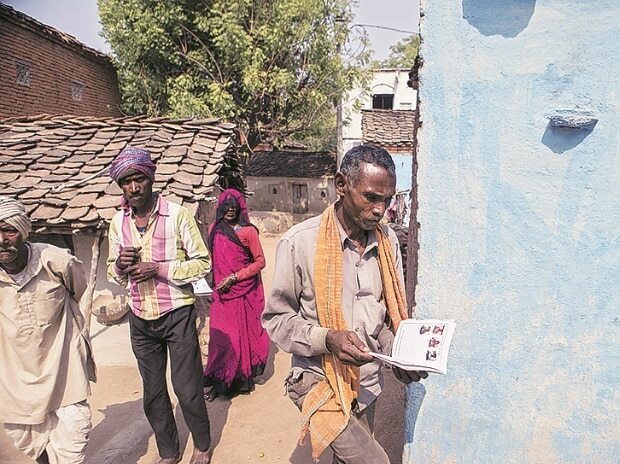 The BJP’s 10% reservation criterion includes households with an annual income less than Rs 8 lakh, agricultural land less than 5 acres (size of three football fields), residential house area less than 1,000 sq.ft, and residential plot less than 900 sq.ft (notified municipal area) or less than 1,800 sq.ft (non-notified municipal area). Note: 93% of Indian households earn less than Rs 8 lakh a year. This is based on 2020 levels utilising the nominal growth rate. “Targeting bottom 50% households via the income threshold alone can be achieved by setting threshold to around Rs 200,000 at all-India level,” it notes, adding that the present threshold “tends to favour wealthy sections of society”, such that the framework “appears more as a political stunt than a reform genuinely seeking social justice”. Based on the housing criteria, the bottom 50% could be targeted if the threshold is reduced by half and set at 500 sq.ft in rural areas and 200 sq.ft in urban areas. The building area is a “poor proxy of building value and and hence a poor proxy for EWS status” because the small building area may not necessarily mean low building value, particularly in urban areas. The combined asset value (land + building) must be around Rs 7 lakh in order to target the poorest 50% of households while households above this value of wealth should be automatically excluded from reservation benefits. The Rs 7 lakh figure is based on prices in 2017 and assumes the same increase in wealth across different wealth groups. So far, the issue of social transfers has been largely neglected from the political campaign, the report notes, adding that it is imperative that Indian increase its spending on health and education. Analysing income, wealth and tax data, the report makes a case for progressive financing of social measures through progressive taxes on income and wealth. This could address “extreme inequality at the top, while financing social spending for bottom and middle income groups”, it says. An alternative 2% tax on land and buildings above Rs 2 crore would yield Rs 2.6 trillion (1.2% of GDP), impacting only the top 1% of the households. This could nearly offset the 1.3% of GDP expenditure that the Congress’s minimum income guarantee of Rs 72,000 a year would cost, as per the report’s estimates.